This is the process of forming metals. The parts of various shapes are produced by electrolytic deposition of metal upon a conductive removable mould. 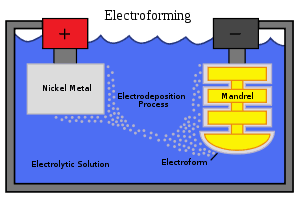 The difference between electroplating and electroforming being that in the former case the metal permanently sticks to the cathode, whereas in latter case a solid shell is produced around the cathode which can be separated from it. The cathode (mould) can be made of any shape depending upon the shape required for the part. The finish of part produced depends upon the surface smoothness of mould. The metal for electroforming the part on the mould is supplied from an electrolytic solution in which a bar of pure metal acts as an anode for the plating current. This process is very useful for thin walled parts where high accuracy and surface finish are desirable. This is also suited to complicated internal shaped parts which are difficult to machine. This process is also very advantageous for production of small number of parts for which other methods will be very expensive. In electroforming process, first a negative image of part, called matrix, mould or pattern is prepared. This can be either permanent or expandable type depending upon the shape of part to be produced. Permanent moulds can be easily machined from metal and are very economical. These can be used only when there is sufficient draft to withdraw them without any damage to the formed part. The expandable type of cores can be either of low melting temperature alloy or of some chemically soluble substance. In case of expandable type of moulds, the substance used may be non-conducting e.g., plastic etc. In such cases they must be coated or expandable type of moulds, the substance used may be non-conducting e.g., plastic etc. In such cases they with some metallic film by spraying, brushing or chemical reduction. Wax mould can be coated with graphite. After the desired forms are prepared, the moulds are placed in the electrolytic solution and proper current is passed in the solution. The mould keeps on receiving the metallic ions from the metallic rod and finally a layer of sufficient thickness is formed around the mould. It is then removed from the bath, rinsed and then stripped from the mould. The various metals used for electroforming include copper, nickel, iron, silver, zinc, lead, tin cadmium, gold, aluminium and others having conducting nature. Out of these, copper, nickel, iron and silver are best suited for electroforming as they have the properties of good reproducibility, resistance to corrosion, good bearing surface and adequate strength for small thickness. The properties of the electroformed parts depend upon the characteristics of the metal used, rate of deposition of metal and plating temperature etc. Some changes in properties of electroformed parts can also be achieved by proper heat treatment. The importance of electro-forming is mainly due to its ability to form complex parts having intricate details. (i) High dimensional accuracy in complicated shaped parts can be obtained. (ii) Various parts having no dimensional variation can be produced. (iii) High surface finish can be obtained. (iv) Parts of any thickness can be easily made and thickness can be easily controlled. (v) Laminated metals can be produced. (vi) Any amount of purity can be achieved. (vii) Special physical and metallurgical properties can be attained on the surface. (a) This is not an economical method of production. (b) Rate of production is normally slow. (c) Cost is very high. (d) Accuracy of exterior surfaces cannot be controlled. (e) Process is limited to very thin part. (f) Limited to certain materials. Generally precision parts which are very costly to produce by other process are best suited to electroforming process. This is mainly used to produce metallic high precision bellows used in transducers, instrument bells, venture nozzles and other precisions parts made of laminated metals.